Interviews with Dana Larsen and Dori Dempster, with input from Neil Allard; Jason Balaam; Maureen Bourke; Sarah Campbell; Marc Emery; Nicholas Fraleigh; and Martin Lee. Cannabis is an ancient medicine and spiritual balm. During its prohibition in the early 20th century, knowledge of its restorative powers was suppressed, creating a form of entrenched social amnesia. Then in the early 1970s, it was re-discovered, first as a treatment for wasting syndrome in AIDS, and then for treating the side effects of chemotherapy. Since then it has steadily re-gained respect as a ‘medicine’ for a wide variety of ailments. Without doubt, this respect has been a force for the good. But in re-naming cannabis a medicine, we have tossed it into an unfortunate grid of categories to which it is not well suited. ‘Medicines,’ as the contemporary public understands them, are made by pharmaceutical companies, and sold in pharmacies either over the counter, or by prescription. They are not made at home, in bakeries, or in private labs. They are not seen as general tonics, spiritual aids, enjoyable relaxants, or enhancers of perception and creative energy. Rather, they are expected to go hand in hand with a string of negative reactions, including death. In tune with this grid, pharmacies in Canada have recently formed a vigorous lobby for exclusive rights to the medical retail market. The category has caused other difficulties as well. Because cannabis has long been demonized, efforts at re-legalizing it as ‘medicine’ have too often ended in new, unproductive dichotomies: the bad cannabinoid that gets you high/the good cannabinoid that doesn’t; the fake patient/the real patient; the good dried flower/the evil extract; the good oil capsule/the evil cookie. In the prohibitionist’s mind, there are still demons. In 1996 the State of California passed Proposition 215, a Medical Marijuana Initiative; in that year, medical dispensaries began to open along the American West Coast, and in Canada, in the cities of Vancouver, Victoria, and Toronto. ‘Medical Marijuana’ became legal in Canada in 2001. Then in 2015, the Liberal Party of Canada, with plans to legalize generally, became Canada’s 23rd federal government. Since then Canadian dispensaries have expanded in number. In response, a few municipalities in BC, adopting a public health perspective, have opted to license and regulate them as ‘marijuana related businesses.’ This process is ongoing, and so will overlap Health Canada’s anticipated announcement, on August 24th of this year, of Canada’s new access rules. Until recently dispensaries in Vancouver have offered memberships to adults with a doctor’s recommendation, or a diagnosis of an officially listed illness, or in some places, a prescription or prescription bottle for a pharmaceutical, such as an opioid, plus photo ID. There are also dispensaries that have simply welcomed adults, but these practices are not the rule, and have never been proclaimed publicly. Then this past June, Marc Emery’s Cannabis Culture dispensary opened in Toronto, with a policy to sell to all adults. Emery is a libertarian, so his choice is not surprising. But on July 15, BC activist Dana Larsen announced that his shop, The Medicinal Cannabis Dispensary, with two locations in downtown Vancouver BC, will henceforth sell cannabis to all adults. The MCD, operating since 2008, still offers full memberships, along with discounts, to patients with a proof of condition, and will continue to carry a full range of medicinal products. So…what should we think? And why now? For Dana, it was simply time. His goal has always been to create general access. Moreover, the Vancouver City Council’s regulations for dispensaries are silent on membership requirements. They’re not really interested in that aspect. They are, on the other hand, interested in money. For all but Vancouver’s few non-profit dispensaries, the Council will require payment of administrative and licensing fees that are staggering in proportion. 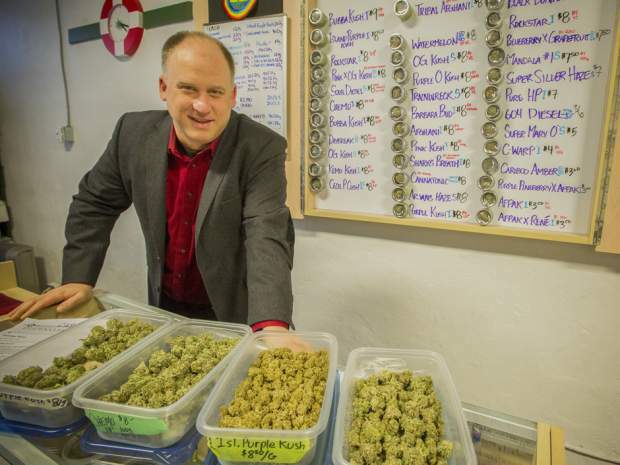 Each of Dana’s dispensaries will be charged a $30,000/year administrative fee, and a $5,100/year licensing fee. According to the City, this money is needed for enforcement. Dana will also have to pay $75-100 apiece for his employees’ criminal record checks—there are 23 employees—plus fees for all building inspections. Naturally, he will pay for any changes required. By contrast, notes executive director, Dori Demspter, the Pacific National Exhibition, with a million visitors each summer, pays an admin cost of $16,200. It’s an improvement over Toronto, which continues to bust dispensaries. But these are not fees with patients in mind. Moreover, says Dana, prescriptions exist because ‘medicines’ are dangerous. Cannabis is not. For Dori Demspter, the change in policy represents a change of heart. She has always encouraged patients to go to their own physicians, and to do battle with them if necessary. She knows how difficult this process can be; she’s been through it. But over the years she has seen patients fired by their doctors, or sent packing by clinics with the words: we do not wish to be known as ‘pot doctors.’ She has seen them labeled unfairly as ‘drug seeking’ patients. She has now come to the conclusion that such a requirement is an unfair barrier to access. In truth, only 16% of Canadian doctors are willing to participate in recommending cannabis; more in BC, and far fewer on the prairies or on the East Coast. Moreover, personal physicians are becoming a rarity in Canada. New graduates have no interest in family practice, so as older family doctors retire no one takes their place. How do you ask people who are ill to risk losing a doctor they may never be able to replace? Or send them off to plead with one doc after another? “I’m just done with this,” she says. Moreover, for Dori, this change is about creating a space for choice. Patients must be allowed to choose what remedies they’d like to try. Right now, for too many, that choice is an illusion. It’s an argument that courts are likely to find compelling. I began by noting the difficulties we run into, calling cannabis a ‘medicine’. But for Dana, calling it recreational is equally problematic. Some people take cannabis for spiritual reasons. Others, because it improves their sexual life. Or helps them in creative work. Stuffing these choices into a ‘recreational’ category trivializes them. Wine shops don’t advertise themselves as places that sell ‘recreational’ wine. In this society, one might add, wine is a sacrament, and single malt scotch, a connoisseur’s elixir. But is a policy to serve all adults problematic in some way? Would it alter the vibe in a dispensary? Would the dispensary become busier, leaving ailing patients with canes and walkers to wait in long lines behind younger folk? Would the recreational business overwhelm the medical, encouraging dispensaries to carry less in the way of salves, or suppositories, for example? Would general dispensaries hire fewer staff members with knowledge of which strain best suits which illness? Would knowledgeable staff have less time available for extended conversations with patients? These are some of the concerns I have heard, and that I’ve had myself. On the subject of supply, both Dana and Dori stress that they will continue to stock all medical products, and offer counseling to any who require it. They remain dedicated to patients. Moreover, the general trade will help to fund patient discounts. On the matter of lines, yes, they note, the dispensaries are busier now, but busier only in the way that they were back in 2008, when Vancouver had only three storefronts. Also, this policy is an experiment. They don’t know exactly what to expect. I asked Dori about the new customers. What’s the demographic? Are they all younger people? No, she said. They are older. Many of them have a medical need, but have never had the gumption to approach a doctor. Or have been refused. They are very grateful. It is natural for different dispensaries to cater to different clientele, providing, in the process, overall variety both in products and atmosphere. At the same time, customers gravitate to places that feel right to them. But for this process to occur, we need choices. 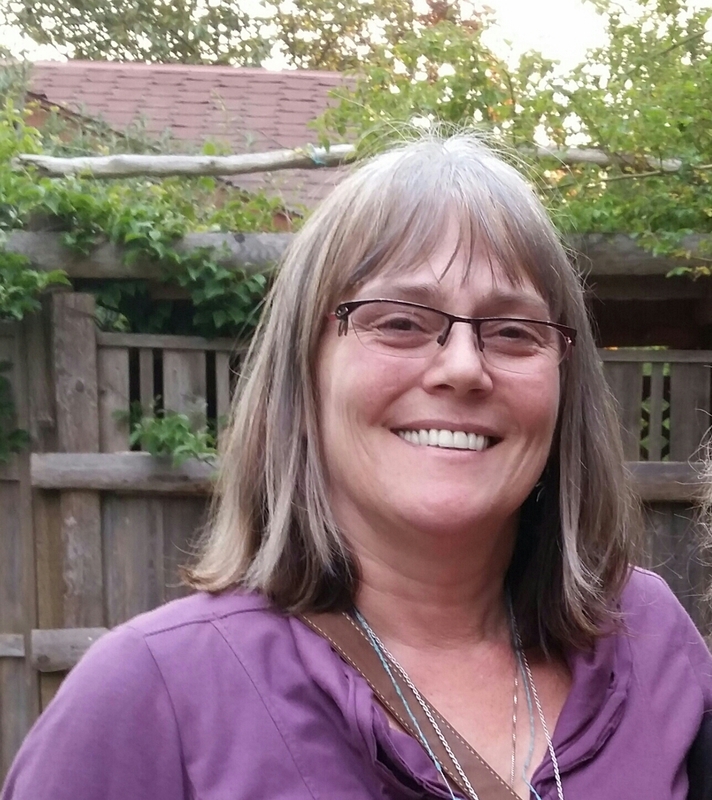 For nearly twenty years, Dori notes, she and Dana have counseled hundreds of people on how to start and run a dispensary. We need neighbourhood shops, she argues. Lots of them. People who are not well, or who have chronic disabilities, should not have to travel across town to get their remedies. They should be able to buy them down the street, where they get their groceries and do their banking. Drastically reducing the number of dispensaries, the goal adopted by Vancouver, and voiced recently by Victoria, is not a policy that favours the well being of patients. It will only make their lives harder. Meanwhile, the dispensary battle continues. 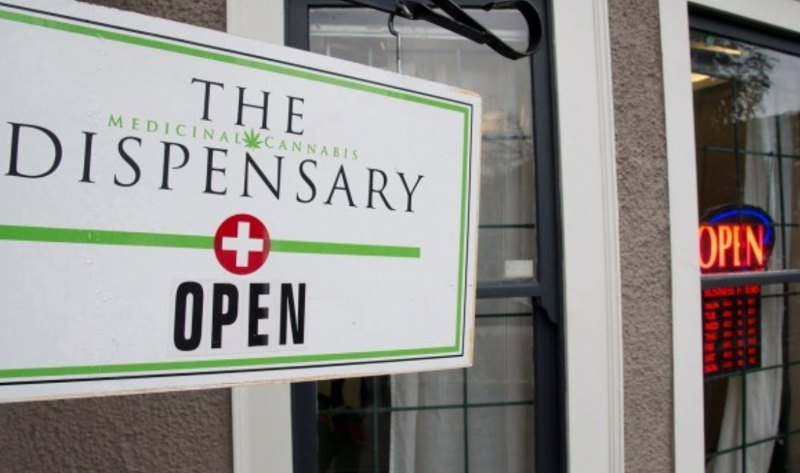 Dana’s Hastings Street dispensary has been served with an injunction. So has his landlord. He has a board of variance meeting, but not until December 14th. He is supposed to close up shop in the meanwhile, an absurd expectation. He plans to remain open. He will offer legal support to all employees, but doesn’t think it will be necessary. The City Council has no plans to summon the police. I asked Dana what he expects from the Trudeau government. Look, he says, the version we get in the near future will be version 1.0. And we’ll probably be happy with version 7.0. In between we’ll have series of court challenges. For the immediate future, he anticipates that Health Canada will underfund its new plan, find itself overwhelmed with requests for licenses, or other services, and bog down. If he’s right, we’re likely to see a free for all that dwarfs the present one, providing yet more reasons to go to court. But then, that’s the Canadian style as we’re coming to know it. Meanwhile, I’m increasingly inclined to chuck the term, ‘medicine.’ I like ‘restorative.’ But there’s also ‘remedy,’ ‘tonic,’ ‘therapeutic,’ and ‘balm.’ Cannabis is a queen. Why box her into a sterile category? Why are law makers and government such dicks. Won’t mention cops. They are just goons doing their job. Why are law makers and government workers such dicks? Won’t mention cops. They are just goons doing their job.